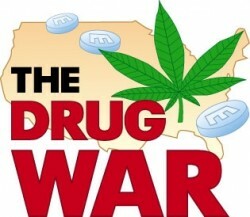 WASHINGTON, DC — Seeking to "narrow the focus of the drug war to the true enemy," Congress passed a bill legalizing drug use for the gainfully employed Monday. "Stockbrokers, lawyers, English professors... you're not the problem here," said DEA Administrator Asa Hutchinson at a White House press conference. "If you are paying taxes and keeping your yard tidy, we're not going to hassle you if you come home from a hard day of work and want to enjoy a little pot or blow. But if, on the other hand, you're one of these lazy, shiftless types hanging out on the street all day looking for your next high, we're coming after you." The new law, which goes into effect May 1, will enable police departments and courts to focus on what Hutchinson called "the real drug offenders." "There's no point going after some cardiac surgeon who needs some speed to keep him sharp," Hutchinson said. "That's not what the law was intended to prevent. But the more destructive drug users - the addict who spends his welfare money on crack, the guy in Harlem who smokes marijuana - that is something that we as a society must not tolerate."